I am thrilled to be included in the Washington Sculptors Group show Ephemeral at Greater Reston Arts Center (VA). This show is part of the group’s Sculpture NOW series and draws its inspiration from the Patrick Dougherty “stick” installation A Bird in Hand added to Reston Town Center this summer. I was able to volunteer to help with the installation for two days of the two-week installation. What a wonderful experience! The Washington Sculptors Group show includes work reflecting 27 artists’ meditations on the fleeting nature of things in general. My piece, “Bycatch I,” which I made originally for the Call and Response show at Episcopal High School in Alexandria (VA) fit nicely with the theme, and I was honored to be selected among the exhibiting artists for Ephemeral. 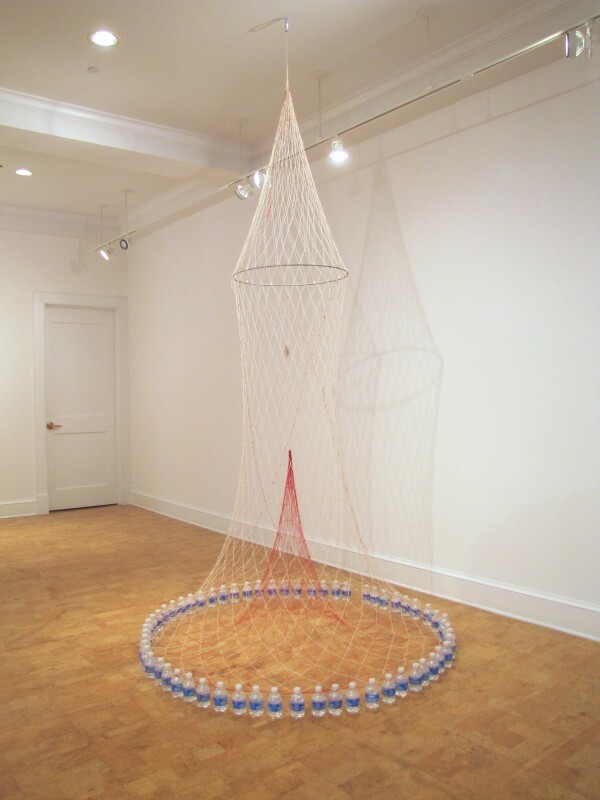 “Bycatch I” is made from white cotton fishing net cord and red flax thread knotted with traditional fishing net knots into a 9-foot suspended form, held open with a 2-foot fishing net hoop and draped to floor where it is anchored with 60 recycled water bottles refilled with tap water. The piece presents the difficult position of coastal fishing communities throughout the world, where overfishing and dwindling fish populations due to damaged ecosystems, as well as changing fish migration patterns, are challenging the fishers’ livelihood. Some fishers are catching species they are not permitted to keep (bycatch) and many are encountering increasing amount of yet another kind of bycatch – garbage. This cycle of human reliance on the natural world and our inability to resist putting overbearing pressures on it is affecting all of us, making an already tenuous balance even more fleeting. I found out at the opening reception on September 11, 2015, that I had been chosen for the Washington Sculptors Group’s 2015 Tom Rooney Award for Excellence in Sculpture. What a lovely surprise! I am excited about the Bycatch series and this award certainly encourages me to continue. This entry was written by beelsebub, posted on September 12, 2015 at 3:53 pm, filed under General. Bookmark the permalink. Follow any comments here with the RSS feed for this post. Post a comment or leave a trackback: Trackback URL.